For keeping my lines open to my friends and Gerald too, I use FB messenger. I only have Viber for my friends at work, because one of them has no FB account. Haha. I seldom send SMS now, I only use it for my parents who still haven’t discovered Messenger. Haha. The iPhone’s native Camera of course, along with the apps for our Canon EOS M10 and GoPro, to transfer photos to phone. Of course, the Photos app where I view the photos! Haha I use VSCO for quick photo edits. I use Google Drive to transfer photos and files sometimes, when I am lazy to connect my phone to the computer. Haha. Usual social media accounts, where I browse updates from friends (online and offline). These keep me awake at work, when I need a break. Not really a travel category, but this is just where I think these apps fits. Haha. I use Calendar a lot, to track of the days, because seriously, sometimes I don’t know what day it is anymore. Also, with Gerald’s shifting schedule, I also have to be mindful of it, so I know when I’ll go get my “me” time. Haha. The image I used for both screen lock and home screen is one of the first photos I took with the phone. It was during rainy season, I think and I just liked the droplets effect on the window of our office, with the view of buildings. I haven’t changed it ever since. Haha. It proves that I don’t really care about how my phone would look in the inside. As for the quick links, I have the Phone, Settings, Messages and Camera because these are what I often use, so they should be easily accessed. Funny how I categorized the apps on this blog post but I don’t even group the apps on my phone, or even sort it according to frequency of use. I was an Android user, and I was so used to how flexible it is when it comes to personalization. I can create “home pages” where I can drag selected apps. There I put all my frequently used apps, and I organize them per page, per category. One home page for a category. When I switched to iPhone, there’s no such thing as home page. When you unlock the phone, all apps are spread out as it is. I tried to organize them, I created groups, but it didn’t work for me. I get more confused. So I just decided to lay them all out, in alphabetical order. It works best for me because I can easily find the app. Also, I keep my apps to a minimal, I make sure they would not consume more than two screens. I always set priorities. Haha. I would delete apps that I no longer use, or those that I am not using often. Out of forty eight (48) apps currently installed on my phone, I am using twenty five (25) of them, each have different frequency of use. Because I am using more than half of all the apps on my phone, I can say that I have only installed what I need. The remaining apps are the ones I’ve only used a few times and those native apps that I can’t uninstall. What are your the apps on your phone that you frequently use? 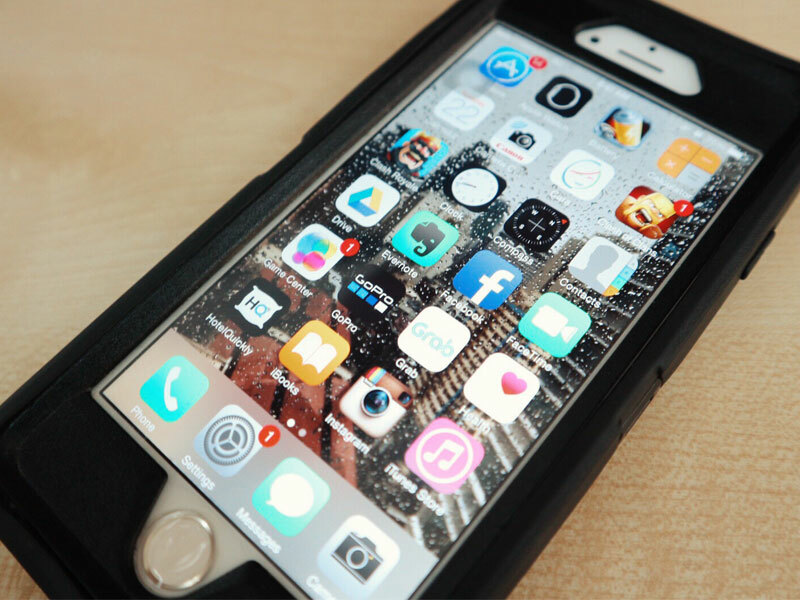 Have you also blogged what’s in your phone? Let me know! Well, I used to not lock my phone before too but I started it just because I want to use the fingerprint scanner feature. Hahaha. My frequently used apps are the chat apps (Viber and FB Messenger), social media apps (IG, Twitter, Facebook, Snapchat) and games: currently playing Clash Royale along with Candy Crush Soda, and Disney Tsum Tsum. I don’t really have that much apps on my phone, safe to say I have less apps than yours. I didn’t not bother creating a screen lock for my phone before too. But one my friends used my phone without me knowing and he sent a text message to another friend. I usually just leave my phone on my table when I’m in the office, I really didn’t bother at all, until that happened. It was actually funny but I got a little bit pissed off, so I created a screen lock which is very easy to hack. HAHA! My iPod used to look like that, I mean, I didn’t categorize my apps too. But when I became an android user, I have managed to group them by their usage. And I love how neat-looking my phone is now. I just installed clash royale last week. But I’m contemplating whether to start playing it or not. haha! I’m actually resisting myself to play any more games until I finish all my backlog at work. I’m very bad with time management, that’s one of the reasons, I guess. I might blog about what’s inside my phone too, soon! I have a diary on my phone thats why i use the lock feature hahah. I have touch id so i dont have to worry that much about remembering the passcode but i use the pass code every now and then too so that i wont totally forget it. The most useful app for me is reminders. I use it to remind me about almost everything lol. Also Notes and social media apps like fb, yt, twitter etc. Just the standard: Facebook, Twitter, Instagram, and Twitter. PS: I’ve been planning to use KFit too, but I’m not quite sure if I wanted to subscribe to the 1k unlimited plan (most workout places are too far from my house… boo). Is the PHP 200 applicable to the “normal” subscription tho? I don’t have a lot of apps in my phone. Like yours, mine is not organised into folders. I like the convenience of easily seeing and tapping them. My most frequently used apps are Facebook, Instagram, Twitter, Email (I have a bad habit of checking emails any time of the day, even on weekends lol), Camera, and the Music app. And my current wallpaper is Sakura and Syaoran from Cardcaptor Sakura (I just finished rewatching the anime series). Haha! My frequently used apps are mostly social media. I try to use game apps more as I really don’t wanna spend time scrolling away my days anymore hahaha. Hmm as for organization, I put the apps I don’t use frequently (but still need) in folders, then the ones that I use often and don’t have any kapareho na apps are out of the folders and on the home screen. I also try to make na nasa 1 page lang lahat haha I’m OC that way. How brave of you not having a screen lock Mei! Hahahaha P.S. I’ll be Alphabetizing my apps too. So cool! Facebook, Twitter, Instagram and Snapchat are my frequently used apps lately. Snapchat is my favorite right now coz of the funny and cool filters hahaha plus my favorite boy bands frequently updates there as well. Hihihi. I’ll make a blog post about it soon! Yay! Wow for that default organizer! But wouldn’t it be confusing? I can’t imagine not locking my phone. Hahaha! Not like I have something to hide, but I guess I was so used to it? And also if ever it gets stolen, the thief won’t get anything from it. Knock on wood, I hope that won’t happen. I basically have all the apps you’re using plus about 50 more that I don’t really use. I get attached to apps even if I don’t use them. Sighs. Love the effect on your wallpaper, btw. I thought that one were from the net. Hehe.